Quite literally the energy behind the shentongroup brand lies with the sum of its parts. 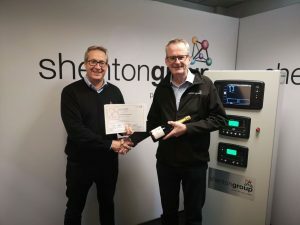 By that, we mean the outstanding members who form the shentongroup team: The UK’s leading technical experts in Standby Power, Uninterruptible Power Supplies and Combined Heat & Power systems. To ensure that we show our appreciation to the hard work they put in, each month shentongroup staff vote for the colleague they feel has gone ‘that extra mile’ in assisting their fellow workers and ultimately, in ensuring that our customers are provided the utmost levels in service and support. From the Colleague of the Month parking space, every morning September’s winner makes his way to shentongroup’s IT Department where he ensures that we all have the hardware, software, connectivity and security we need to deliver our projects on time. Here’s a big thank you and congratulations to John Duffy. As well as the Colleague of the Month parking space, John receives a certificate, vouchers and a bottle of bubbly. If you need continuous power services and support from a dedicated, passionate and accountable team of professionals, click here to get in touch.